Goldmoss Sedum (Sedum acre) is the perfect sedum for rock gardens and borders. The Sedum’s deep green carpet of foliage becomes completely engulfed with yellow flowers in summer. During cold months the foliage turns a beautiful shade of red. Use Goldmoss in and among stepping stones, a rock garden path, or along a fence line. 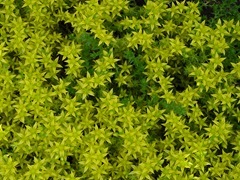 Goldmoss Sedum is deer resistant and very drought tolerant. Height: Tight to the ground. Tips: Good drainage is a must for sedums (stonecrops) and over watering will impair growth. 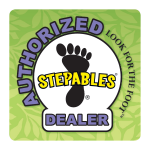 Click here to buy Stepables direct from www.buygardenvegetables.com.